shipping and handling added at check out. There are 12 blocks in this set. 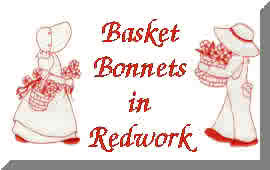 Redwork designs are embroidered on good quality muslin (bleached or unbleached). What ever i have on hand when you place your order. I try to keep at least one set in inventory of each block. If not in stock please allow 2 weeks delivery on the item you order. Threads used are Maderia. All blocks are completely washable. All blocks comes from a smoke free studio. See our policies on home page before ordering. No all 12 blocks pictured here. all designs are 5X7 inch.